I tried a new recipe for these pistachio macarons. I usually follow the recipe that I wrote about in my French macaron tutorial from a couple of years ago, but since changing ovens I’ve been having troubles with hollow and cracked macarons. The recipe in my French macaron tutorial is primarily based on Stella’s from Bravetart. On her blog, Stella debunks a lot of macaron “myths” like having to age egg whites and waiting for the macaron shells to dry out before baking them. She says that doing both of these things is not necessary for her. For me, it is. I want to explore the reasons why in this post. With my old oven, I used Stella’s method and my macarons came out fine. But, after changing ovens, I often ended up with hollow and cracked macarons. I wasn’t sure what was going on. I was using the exact same recipe and technique. The only difference was the oven. After a couple of annoyingly flawed batches, I decided to switch recipes to see if anything would change. I used one from Antonio Bachour’s new book Bachour (not an affiliate link). The major differences between the new method I used and Stella’s is that the new recipe (a) has lower sugar content by mass, (b) uses aged egg whites, and (c) advises drying out the macaron shells before baking. That recipe made these pistachio macarons. Two of the major changes, B and C, are what Stella has dubbed “macaron myths”. My macarons, these pistachio ones, turned out super well. It appeared that, for some reason, what was a myth in Stella’s kitchen and my old house was no longer a myth. Why? I think it has to do with heat distribution. The traditional idea behind drying out macaron shells before baking them is that a dried-out, hard top forces the macaron batter to expand downwards, and create a ruffled bubble of “feet”, instead of upward, cracking the shell. In my new oven, which had poor heat distribution, cracked macarons appeared in specific areas with Stella’s method. These were the hotter parts of the oven. This makes me think that drying out the macaron shells is like a “safety net” that protects macaron shells from uneven heat distribution. In hot areas, where the batter expands quicker, dried out shells may prevent cracking and promote feet. Stella had a good oven and maybe that’s why she didn’t need to do it. For her, drying out macaron shells was a “myth”. That’s also perhaps why I didn’t need to do it before with a good oven but, now with a less than stellar oven, I do. But wait a second, why did I switch to using a recipe with lower sugar content? Well, with Stella’s recipe, the macaron shells don’t really dry out because of the large amount of sugar in the shells. I made a batch of Stella’s macarons and I had to wait over an hour for the shells to get just a little bit drier. There’s no point of waiting half an hour, like most recipes suggest (and that includes my previously published tutorial), with Stella’s recipe. There won’t be a discernable difference. I used a recipe with less sugar because that’s the only way to have dried out the shells before baking. What about aged egg whites? I’m not sure. I’m still running some experiments to try and figure out the effects of aging the egg whites on macarons. What’s tricky is the interaction of whipping time with egg white age. Stella’s says that there’s no need to use aged egg whites, and she beats them for a long time. On the other hand, most recipes use aged egg whites and beat them for less time. So, the question isn’t just whether egg whites should be aged. It’s more of a question of whether aging egg whites and beating to medium peaks is better than not aging egg whites and beating to stiff peaks. I’m not sure yet. This recipe uses the former option. I’m still playing around with these ideas, and so I don’t want to make it seem as though this is the definitive answer. These aren’t conclusions, but rather hypotheses. I’d love to get some input on how you make macarons (if you do) to help accept or reject them. Do you age your egg whites? Do you let them dry out before baking? How’s your oven? You can follow me on Twitter as I explore these ideas… Alton Brown does!! 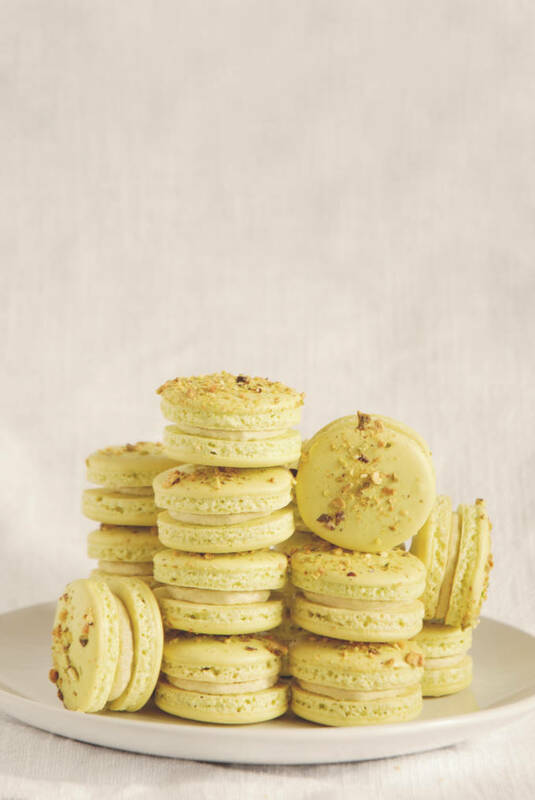 A recipe for scrumptious pistachio macarons with a lovely green buttercream and a crunchy pistachio topping. Recipe from Antonio Bachour's Bachour. Separate the egg whites from the yolks, seal tightly in a container, and put in the fridge between 3-7 days before proceeding. Sift confectioner's sugar and almond flour into a large bowl. Set aside, disposing of the two or three tablespoons that can't be sifted through. 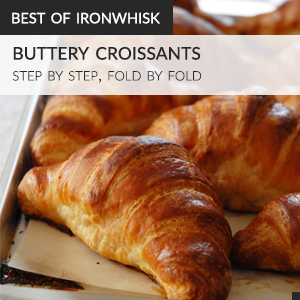 In a stand mixer fitted with a whisk attachment, whip egg whites on medium speed until foamy. Add sugar in three additions, mixing for 30-45 secs between each addition. Whip until glossy with medium peaks. Add food coloring and beat on medium speed for thirty more seconds, or until the food colouring is evenly distributed. With a large rubber spatula, fold in half of the almond mixture. Then, fold in the remaining almond mixture until smooth and glossy. Your goal here is to deflate the egg whites, so no need to be super gentle. All ingredients should be well combined and the mixture should flow from your spatula, recombining into the batter within 10-15 seconds. Line a baking sheet with parchment paper and, using a piping bag with a ½ inch round tip, pipe macarons about 3.5cm (1.4 inches) in diameter about 4cm (1.5 inches) apart from one another. After you're done, hit the sheets against the counter to flatten mounds and pop any large air bubbles. Sprinkle some coarsely ground pistachios on alternating rows of macarons (the ones with the pistachios will be the top macaron shell). Let rest on the counter for thirty minutes while you preheat your oven (using a convection setting if you have it) to 135°C (275°F). Bake for 15-18 minutes, and let cool on the pan. Remove the shells from the pan with an offset spatula. Cream together the butter and icing sugar on low speed using the paddle attachment, if you're using a stand mixer. Add the ground pistachios and beat on medium speed for three minutes. Pour in the vanilla extract and whipping cream and beat for one minute on medium speed. Using a piping bag with a ½ inch round tip, pipe a small dollop of buttercream onto the macaron shells that were not sprinkled with pistachios. Press a macaron shell that was topped with pistachios (if you chose to do so) into the cream, gently. Let rest in the fridge for ~3 days until the macarons become softer. If you do not wait they will not be as good. Resist the urge! ooooh that’s interesting! thank you so much for the info! I’m so excited/scared to tackle macarons so I’m totally soaking up all the knowledge! I have yet to try my hand at these delicacies. Congratulations on the success although I know exactly how frustrating it is to have a few failures in the development process, ovens can be finicky too. Your macarons are so even, it sounds like you didn’t use one of those new fangled pans either…how did you do it? They look wonderful. Good luck with your new shore, can’t wait to see it. Thanks for the info! They look gorgeous, and I hope all is going well. Thanks for debunking some of the “myths”. Your explanations make some sense as to why my macarons never work out. I seem to get cracks when i add toppings like pistachios……do you know why?